Should the construction industry look to larger lorries? Travel pollution is a hot topic. And one of the largest culprits for lowering air quality through travel is bulk movement HGVs that make their way up and down the UK in their droves every single day. Sustainable transport is making its way into the car and van market but is yet to make an impact on HGVs. It’s a responsibility for all construction companies to look at improving and Transport for London has recently undergone research to look into ways construction lorries can lower road pollution. The study for Transport for London by consulting engineer WSP concluded that construction companies should look to use larger articulated lorries for deliveries, specifically in the capital. It is claimed that using articulated lorries instead of the more common rigid trucks would reduce pollution and traffic. 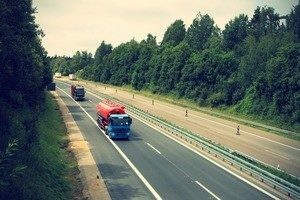 In London alone, the study found that a switch to the more fuel-conscious lorries for bulk construction materials could reduce CO2 emissions by 32% and the total number of construction lorries on the roads by up to 37%. Industry concerns for articulated lorries such as their stability and presence on the road were also quashed in the study. Rigid HGVs remain the most common for bulk movement of construction materials in London but there has been a growth in the use of articulated HGVs in recent years. HGV drivers remain much needed in the industry and there are appealing financial rewards available for those that pursue a career in the industry. There is also an exciting movement in the industry towards new, fuel-efficient lorries. Have you ever considered a career as an HGV driver? For persons who enjoy driving, life as a truck driver can be a very lucrative one. With the right training and skills, drivers can build themselves a worthwhile career in logistics. To find your next role or begin your career as an HGV driver, get in touch with Embark Recruitment today on 01530 588 841 or browse our current HGV driver jobs.